Fiddler on the Roof opened at the Encore Musical Theatre Company in Dexter, MI last night, and if the crowd response was anything like it will be throughout the run, Encore has another hit musical on its hands and you should get your tickets now. Full disclosure: I am not a proponent of large proscenium-theater based musicals being crammed into black boxes with reduced orchestrations. That being said, this is the best “large cast” musical that Encore has presented in their theater space. That is both a compliment and a liability. Guest Equity actor Stephen West is spectacular in his role of Tevye. The show belongs to him, and he commands your attention in every scene he is in. His voice resonates throughout the theater, and his charisma is infectious. He also has the acting chops to make the journey memorable from beginning to end. Do not miss this performance. 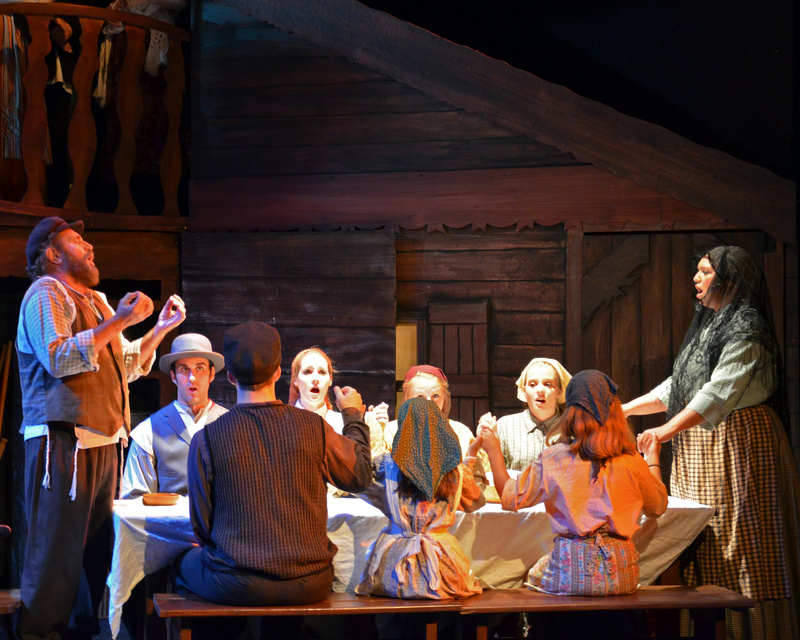 The leads in Fiddler are consistently good to excellent…among the standouts are strong performances by all three of-age daughters as played by Katherine Kujala (Tzeitel), Clare Lauer (Hodel) and Hannah Clague (Chava). Marlene Inman-Reilly holds her own as Tevye’s wife Golde, and their scenes together are musical theater gold indeed. “Do You Love Me?” is a highlight of the evening. Sebastian Gerstner turns in a dynamic performance as Perchik (and makes the most of being saddled with the musical’s worst song, “Now I have Everything”). Also good are Judy Dery as Yente the matchmaker; Tim Brayman as Lazar-Wolf; and John Hummel as Motel. The Ensemble here is good, but insufficient. There is that liability I spoke of earlier. The show is lacking at least 8 men. I don’t blame this at all on Encore, but our over-saturated big-musical market in the Ann Arbor area where men who can sing and dance are at a premium and spread over at least 7 other musicals this summer. When Encore veers from smaller musicals, they are in the same boat as all the other community theaters in the area: beg, borrow, plead, and cajole to get enough men into the ensemble. Want to know how to help out guys? AUDITION!…But Fiddler is probably not the best choice for this small space. The Original Broadway Cast and 70‘s and 90’s revivals included 45 members. The 2004 revival 40. The Encore production 25. This results in curious moments like the Rabbi’s son drinking in the inn…and awkward costume/makeup changes like Jesse Barfield playing Russian Fyedka in one scene, and a bearded local in the next. Awkward. It also leads to a less-than-compelling “To Life” in the Inn — there aren’t enough men to cover both the Russian and the local factions, and the ensemble is out of breath after their dance number so that vocal highlights are missing throughout. Other ensemble scenes work better, but are generally hit-or-miss. Toni Auletti has designed a beautiful woodwork village set; and the integration of Marc Chagall imagery works well. Costumes are generally serviceable, with more attention paid to the leads, and less to the ensemble. Lighting is good. Cheryl Van Duzen’s 5-piece orchestra sounds wonderful, though anemic. The Fiddler orchestrations are written for 19 pieces, and reduced to 10. 5 just is insufficient for this large musical. There are some curious directing choices that have been made by director/choreographer Barbara Cullen. The use of the Fiddler on stage works in some scenes, while it is intrusive in others. Emily Slomovits is an accomplished violinist, and she is fun to watch on stage (usually). Scene changes are “danced” which is a brilliant addition in Act One, but becomes intrusive in later goings as things turn more serious. Things in Act One work generally better than those in Act Two as it makes its slow slogging march to the inevitable conclusion, shedding daughters as it goes. That isn’t Encore’s fault, nor the directors, but a function of the show itself. While the cast hits its marks in the bits of business required, Jewish (and Russian) intonations and accents come and go, and there is a sense that many in the cast are going through the motions and mannerisms without really understanding why they are doing them –and nobody touches a Mezuzah when entering through doorways in this very religious community. This is a very white-bread Jewish community to say the least. But I save the most glaring problem for last. I don’t know why a decision was made to end Act One after Tevye’s Dream rather than as written to end after the wedding and the Russian demonstration. This is a glaring problem and I have never seen this done with Fiddler. One loses the passage of time, and the intended drama of the piece. Its a mistake. I think it’s quite amazing what The Encore Theatre can do on it’s tiny stage. I’m always delighted with their shows. I’m willing to accept and enjoy the double-casting. I can’t wait to see Fiddler on the Roof! It’s one of my favorites. Second: I have consistently let my opinion be known that big proscenium musicals don’t work in small black box theaters. Third: I normally do not go see the big proscenium musicals at Encore, but went to see Fiddler out of deference to my friends both onstage and off. Fourth: Thanks for your comment! Different strokes for different folks. Perhaps you and I have had similar opposing views on “All That Chat” as well? Fifth: Encore aspires to be more than community theater. They advertise themselves as professional musical theater. As such, they open themselves to such criticism. I normally do not review community theater. When Encore does big community theater shows, it is evident. There are productions that are appropriate for black boxes and there are those that are not. Incidentally, the theater asked for my assistance in identifying more men for them. I supplied them with a dozen names. I know for fact that those men were doing other shows this summer. Sixth: you are correct in your comment that I would not personally direct any large show such as this in a black box. I direct fully orchestrated large scale musicals in appropriate proscenium venues. You can go back a few years in my blog to find an article in which I list appropriate and inappropriate shows for black boxes. That article has been referenced by several of the professional theater companies around town and nationally.